Motorola has expanded its ROKR line, introducing three new music-centric handsets including the candybar EM30, the EM28 clamshell and the EM25 slider with FM radio sharing capabilities. 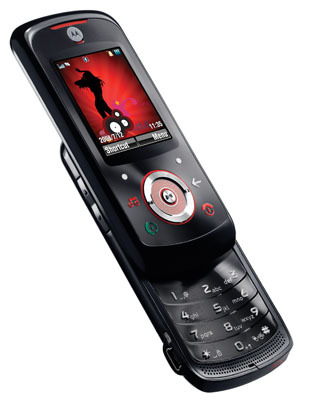 The EM30, features Motorola’s ModeShift technology for fast music mode to phone mode switcheroos; red keys illuminate the keypad in music mode and the keypad goes blue in phone mode. The EM30 also includes high-fidelity audio, fast MP3 downloads, FM radio with Radio Data System technology, 3.5mm stereo headset jack and Windows Media Player 11 compatability. The EM28’s touch-sensitive, music-player keys appear only when they’re needed, and the front screen shows the name of the artist and song without opening the phone. Hot features include: A 3D sound effect, audio equalizer with 11 pre-set music genres and bass boost. The EM25 comes with a built-in FM radio, dedicated music key, controls to play, pause, forward and rewind songs, FMShare a function that allows users to share a favorite station with friends by sending it in a text message and SONGID technology to identify a song while out and about. The ROKR EM30 is expected to launch first in Taiwan then in other markets throughout the quarter, while ROKR EM28 and ROKR EM25 will be available later this quarter around the globe. Pricing has not yet been announced.